Exhibit - BrewTech Robotics Inc.
Every year, BTR Inc. updates the design and layout of their exhibit booth to both match the game and to support the most modern technology with their booth. 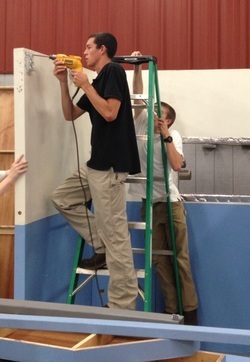 Hunter and Geoffrey working on taking down our exhibit booth from last year's South's BEST competition. This year, for War Eagle BEST, we are changing our complete layout and design to match this years game. 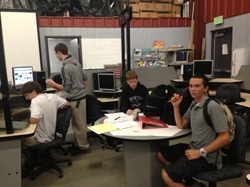 Noah, Adam, Nick, and their director, John, are working on the exhibit interior and exterior design.